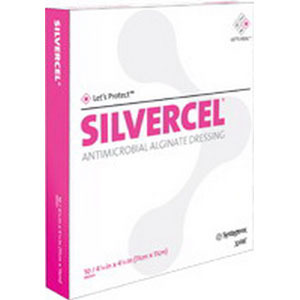 Silvercel® Anti-microbial Dressing is a sterile, non-woven pad composed of a high G (guluronic acid) alginate, carboxymethylcellulose (CMC) and silver coated nylon fibres. Due to the excellent fluid handling capacity and the prolonged Anti-microbial activity Silvercel® is an ideal dressing for the management of chronic wounds. Increases its tensile strength when in contact with wound exudate, allowing for intact removal. Minimises the risk of maceration and leakage. Has been proven to absorb and retain fluid even under compression.